Is K-Rod primed for another perfect save season for the Brewers? 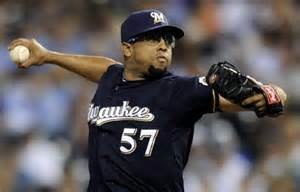 With a save on Wednesday against the New York Mets, Milwaukee’s Francisco Rodriguez picked up his 15th save this season in 15 opportunities. He is one of five relievers this season who have 10 or more saves and have not blown a save, a perfect 100% save percentage. The others: Glen Perkins (24 saves with Minnesota), Andrew Miller (17 saves with the Yankees), Jonathan Papelbon (13 saves with the Phillies) and Shawn Tolleson (10 saves with Texas). In the Brewers history, only one relief pitcher has gone a whole season with 10 or more saves and not have a blown save… you guessed it, K-Rod did it for the Brewers in 2013 when he had 10 saves in 10 attempts. There have been seven pitchers in MLB history who have a 100% save percentage (minimum of 20 saves in a season). The last relief pitcher to accomplish this feat was Jose Valverde of the Detroit Tigers in 2011. He had 49 saves that season and no blown saves. Eric Gagne holds the MLB mark with 55 saves and no blown saves in 2003 for the Los Angeles Dodgers. The other pitcher with 40-plus saves and a 100% save percentage is Philadelphia’s Brad Lidge in 2008 when he was perfect in 41 save attempts. Can K-Rod finish the season without a blown save and become the second relief pitcher in MLB history (with a minimum of 10 saves in the season) to have a 100% save percentage in two different seasons (Rod Beck is currently the only pitcher to achieve this; he had 28 saves in 28 save opportunities for the Giants in 1994 and 20 saves in 20 attempts for the Padres in 2003)?